Download "1 MEMBER INFORMATION Policy No. MZ0909533H0000A"
2 3 Statement of Health Each applicant, please answer all questions: Member Spouse 1. Have you ever had chest pains, disease or disorder of the heart, liver, kidneys or lungs, high blood pressure, albumin or sugar in your urine, diabetes, cancer, tumors or ulcers? Yes No Yes No 2. Have you ever had or been treated for heart trouble, stroke, Hepatitis B or C, high blood pressure, ulcerative colitis, kidney or liver disorder, blood or circulatory disorder, diabetes, any mental or nervous disorder, drug abuse or alcoholism, lung disorder, cancer or tumors? Yes No Yes No 3. Have you, during the past 24 months, consulted a physician or other Practitioner, received treatment for any disease, ailment or injury or been confined or treated in any hospital or similar Institution? Yes No Yes No 4. Have you ever tested positive for exposure to the Human Immunodeficiency Virus (HIV) infection or been diagnosed as having AIDS Related Complex (ARC) or Acquired Immune Deficiency Syndrome (AIDS) caused by the HIV infection or other sickness or condition derived from such infection? Yes No Yes No 5. Have you had any condition for which hospitalization or surgery has been advised, or is contemplated, within the next year? Yes No Yes No 6. Are you involved in the operation of an aircraft, car racing, water racing or involved in sports such as bungee jumping, scuba diving, amateur or interscholastic athletics, hang gliding, ballooning, parasailing, mountain climbing, or hunting? Yes No Yes No 7. Have you ever applied for life or health insurance, which has been declined, rated, or modified in any way? Yes No Yes No Please give full details if you or your spouse answered YES to any of the above questions. (Use separate sheet if necessary.) PLEASE NOTE: INCOMPLETE INFORMATION WILL DELAY THE PROCESSING OF YOUR APPLICATION. 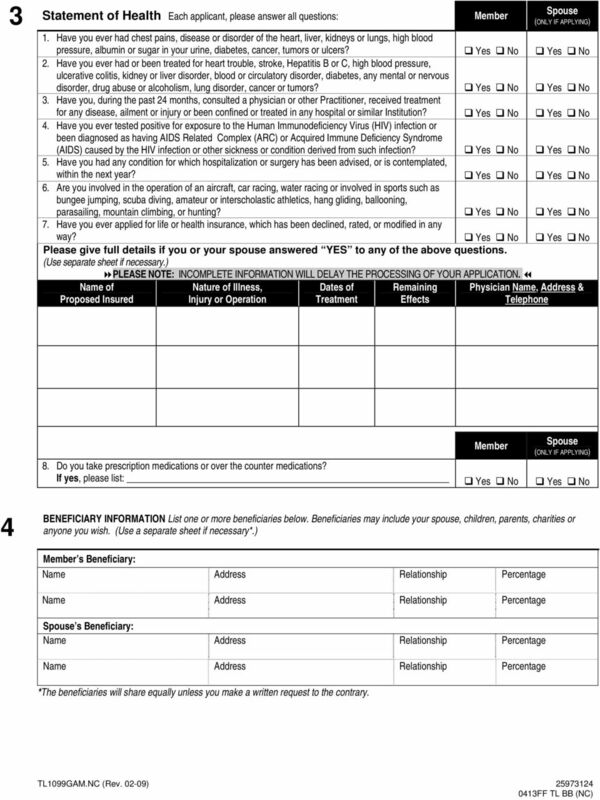 Name of Proposed Insured Nature of Illness, Injury or Operation Dates of Treatment Remaining Effects Physician Name, Address & Telephone Member Spouse 8. Do you take prescription medications or over the counter medications? If yes, please list: Yes No Yes No 4 BENEFICIARY INFORMATION List one or more beneficiaries below. Beneficiaries may include your spouse, children, parents, charities or anyone you wish. (Use a separate sheet if necessary*.) Member s Beneficiary: Spouse s Beneficiary: *The beneficiaries will share equally unless you make a written request to the contrary. 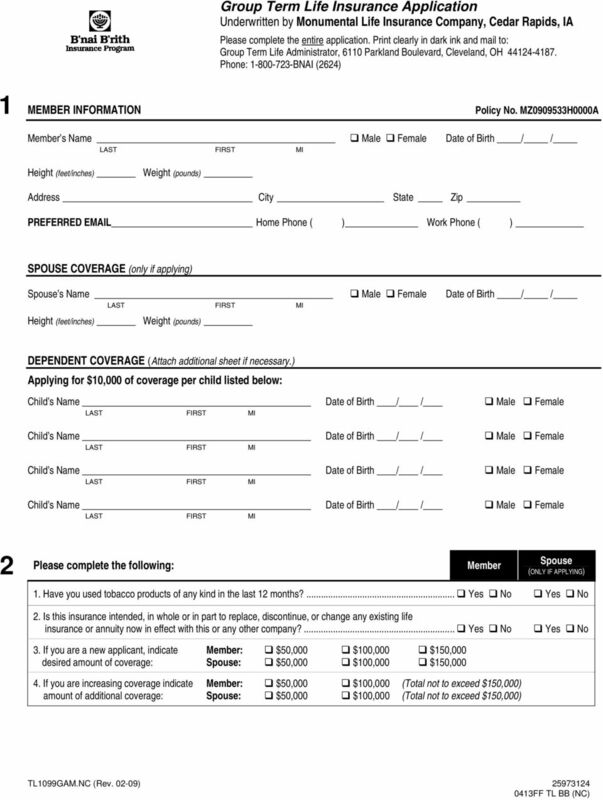 3 5 CONVENIENT PAYMENT PLAN Please read the enclosed Account Deduction Authorization Agreements & Conditions form. I hereby authorize the necessary Financial Institution deductions for the Term Life coverage from one of the following accounts: Checking Enclose voided check. Account Number: Savings Enclose Deposit Slip. Financial Institution Name: Deduction should be taken: Quarterly Semi-Annually Annually Name(s) on Account: Signature: Date: 6 -OR- Enclosed is my first Semi-Annual Annual premium payment made payable to SELMAN & COMPANY. I hereby apply for the Group Term Life Insurance Plan underwritten by Monumental Life Insurance Company. I understand and affirm by my signature below that all statements are, to the best of my knowledge and belief, true, full, complete and correctly recorded. I understand that all insurance coverage under this policy is contestable in accordance with the Incontestability Provision in this policy, if I have made a false statement, material misrepresentation or omission, or failed to update the Company on any health status change prior to the effective date of this coverage. To determine my insurability or for claims purposes, I authorize any medical practitioner, institution, VA Hospital, insurance company or person having knowledge of my health, or the MIB to give any information about my physical or mental health to Monumental Life Insurance Company, Admin. Office: Baltimore, MD , or its authorized representatives. This authorization, original or copy, is valid for two years from the effective date of coverage and is available to me or my representative upon request. I acknowledge receiving the NOTIFICATION regarding the MIB. I understand that the coverage will take effect on the Effective Date shown on the Certificate of Insurance, provided the first premium has been paid and there has been no change in my insurability since the date of the application. 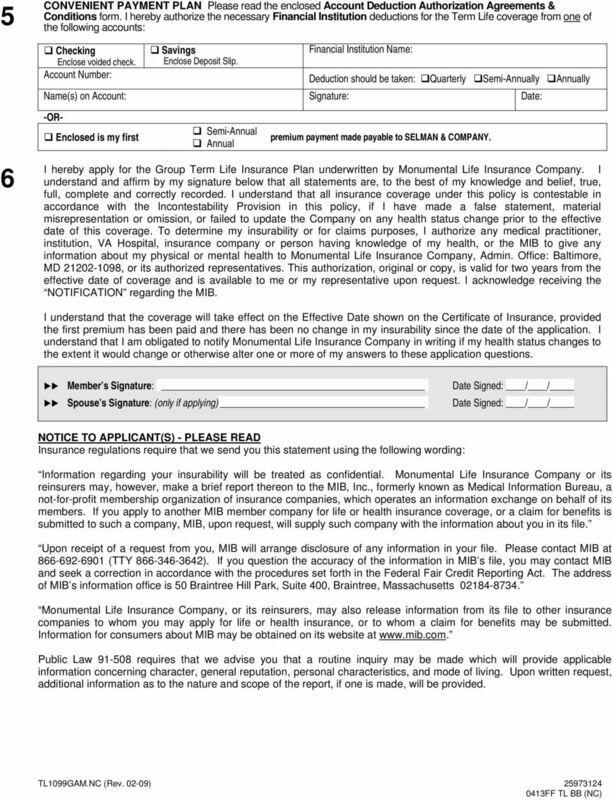 I understand that I am obligated to notify Monumental Life Insurance Company in writing if my health status changes to the extent it would change or otherwise alter one or more of my answers to these application questions. Member s Signature: Date Signed: / / Spouse s Signature: (only if applying) Date Signed: / / NOTICE TO APPLICANT(S) - PLEASE READ Insurance regulations require that we send you this statement using the following wording: Information regarding your insurability will be treated as confidential. Monumental Life Insurance Company or its reinsurers may, however, make a brief report thereon to the MIB, Inc., formerly known as Medical Information Bureau, a not-for-profit membership organization of insurance companies, which operates an information exchange on behalf of its members. If you apply to another MIB member company for life or health insurance coverage, or a claim for benefits is submitted to such a company, MIB, upon request, will supply such company with the information about you in its file. 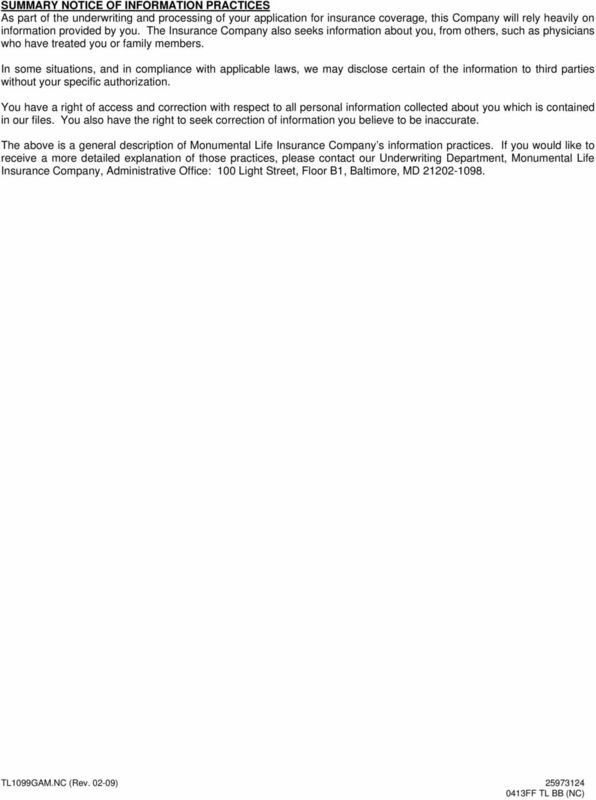 Upon receipt of a request from you, MIB will arrange disclosure of any information in your file. Please contact MIB at (TTY ). If you question the accuracy of the information in MIB s file, you may contact MIB and seek a correction in accordance with the procedures set forth in the Federal Fair Credit Reporting Act. The address of MIB s information office is 50 Braintree Hill Park, Suite 400, Braintree, Massachusetts Monumental Life Insurance Company, or its reinsurers, may also release information from its file to other insurance companies to whom you may apply for life or health insurance, or to whom a claim for benefits may be submitted. Information for consumers about MIB may be obtained on its website at Public Law requires that we advise you that a routine inquiry may be made which will provide applicable information concerning character, general reputation, personal characteristics, and mode of living. Upon written request, additional information as to the nature and scope of the report, if one is made, will be provided. 5 Please retain this document for your records. Account Deduction Authorization Agreements & Conditions Automatic Payment Option (Account Deduction Authorization) is subject to the following Conditions: 1. Premium payments will be debited from your account on or about the premium due date. 2. Additional premium that may be required in order to keep policy(ies)/certificate(s) current may be drawn from your account through the use of multiple debits. 3. 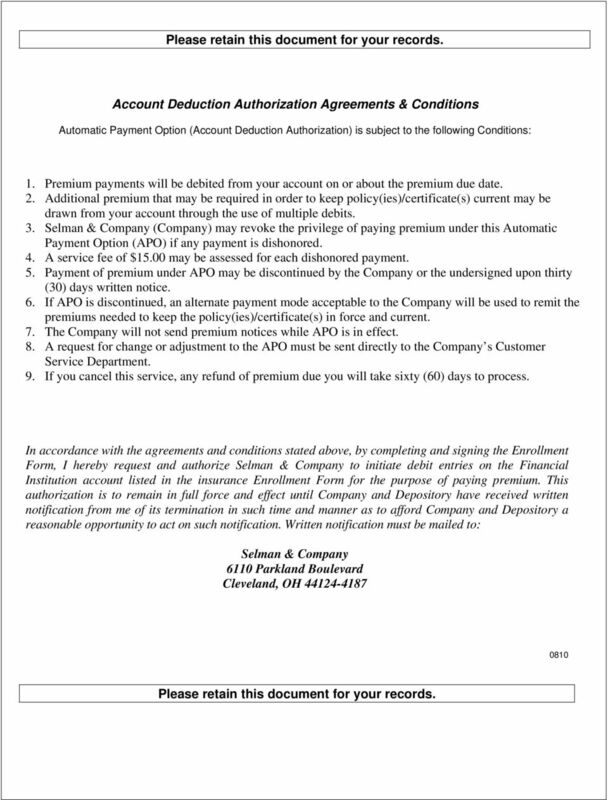 Selman & Company (Company) may revoke the privilege of paying premium under this Automatic Payment Option (APO) if any payment is dishonored. 4. A service fee of $15.00 may be assessed for each dishonored payment. 5. Payment of premium under APO may be discontinued by the Company or the undersigned upon thirty (30) days written notice. 6. If APO is discontinued, an alternate payment mode acceptable to the Company will be used to remit the premiums needed to keep the policy(ies)/certificate(s) in force and current. 7. The Company will not send premium notices while APO is in effect. 8. A request for change or adjustment to the APO must be sent directly to the Company s Customer Service Department. 9. If you cancel this service, any refund of premium due you will take sixty (60) days to process. In accordance with the agreements and conditions stated above, by completing and signing the Enrollment Form, I hereby request and authorize Selman & Company to initiate debit entries on the Financial Institution account listed in the insurance Enrollment Form for the purpose of paying premium. This authorization is to remain in full force and effect until Company and Depository have received written notification from me of its termination in such time and manner as to afford Company and Depository a reasonable opportunity to act on such notification. Written notification must be mailed to: Selman & Company 6110 Parkland Boulevard Cleveland, OH Please retain this document for your records.